Put to any premodern composer, it would have elicited an unhesitating, if unreflective (and philosophically perhaps untenable) reply: “Why, I am, of course!”…Asked among the modernists, however, Cone’s question would produce a chorus akin to that elicited by the Little Red Hen: “‘Not I,’ said the composer; ‘Not I,’ said the performer.” When art turns back on itself and its human content is denied, there is nothing left to express, as Stravinsky put it so bluntly in his autobiography. Taruskin, of course, refers to Stravinsky’s infamously “blunt” contention that “music is, by its very nature, essentially powerless to express anything at all” (1990, p. 53). Under this tenet Stravinsky constructed music that exhibited the kind of “distancing of voice from utterance” (p. 53) that literary theorists have, not unproblematically, termed authorial absence—a common trait of expressively impotent art. “Who is speaking?” “Not I,” said Stravinsky in words and music that were at best largely borrowed from other writers and composers, at worst intent on annihilating subjectivity altogether. For Harvey then, trance-like authorial absence surrounds The Rite, while something tantamount to amusing authorial surrogacy (the parading of borrowed “voices”) pervades The Rake. Hyde endorses Harvey’s reading of Stravinsky and Auden’s opera, presenting these borrowed voices as a compendium of references to “The Beggars Opera, Don Giovanni, Così fan Tutte, [and] Don Pasquale,” not to mention Goethe’s Faust and Monteverdi’s Orfeo, or the broader “philosophical themes plucked from Nietzsche and Kierkegaard, as well as a mixture of Classical and Baroque harmonic and contrapuntal forms” (Hyde 2003, p. 135). Cross is even more expansive, if less explicit, in his intertextual wanderings. To Hyde’s compendium he adds Bach, Handel, Verdi, “virtually the whole of operatic history” (Cross 2003, p. 137). Even the great Diaghilev would struggle to “impresario” his way around an operatic “cast” of that magnitude! Two brief examples highlight this stark contrast of absent and surrogate voice(s) between these two works. When, as Cantoni (1994) has observed, Tom and Anne sing their “discovery duet” in Act II of The Rake’s Progress [Example 1], it is through the “fresh, entertaining, wit” of an intertextual reference to the surrogate “other voice” of Verdi’s Rigoletto: the analogous Act II “discovery duet” between Gilda and Rigoletto, to be precise [Example 2]. The tell-tale musical sign invoking the allusion is the shared distribution of the sixteenth note pattern between the upper and lower registers of the accompaniment. This is underscored by the inescapable dramatic parallel: Rigoletto discovers that Gilda has been seduced by the Duke and Anne discovers that Tom is lost to the seductions of London. Tom, Anne and Stravinsky’s utterances are all “double-voiced” (a Bakhtinian concept to which we shall return): that is to say, they are shot-through with the expressive intentions of Rigoletto, Gilda and Verdi’s “other voices.” The would-be interpreter is thus confronted by at least a duality, if not plurality, of authorial “voices” at play. By contrast the famous (asthmatic) bassoon solo opening of The Rite of Spring [Example 3] appears to eschew any sense of authorial voice altogether. True, it is built from a Lithuanian folk song fragment, and in that sense is potentially expressive of the “voice of the volk”, but both its “primordial” associations and its rigorous, if subtle, additive construction principles render it stark and “voiceless” at another level. It is, in other words, symptomatic of Stravinsky’s two conflicting conceptions of the work, neither of which attributes a high degree of authorial “presence” to the ballet. Initially Stravinsky claimed that the “anecdotic” work emerged as a dream of an ancient pagan rite, of which he was “merely the vessel through which it passed”. Later that dream was converted into an “architectonic” work conceived and constructed as a “purely musical idea”. If there is any sense of “double-voicing” at play here, it is surely only in so far as the opening embodies two opposed conceptual identities: i) the timeless lyrical folk evocation of an ancient pagan spring ritual, “received” through the kind of Dionysian possession that Harvey hears (befitting of Stravinsky’s anecdotic work); and ii) the dehumanised, machine-like, additive, permutational construction of cellular motifs that Nattiez’s (1975, p. 283) paradigmatic analysis of the passage (reproduced in [Example 4] exposes (befitting of Stravinsky’s architectonic work), signalling a higher degree of Apollonian formal control over this meandering bassoon passage than first meets the eye or ear. Harvey, of course, is not the only commentator to highlight these poles of authorial absence and surrogacy as paradoxical, yet inescapable, constituents of Stravinsky’s “authorial” voice diametrically located between The Rite and The Rake. Boucourechliev’s description of Stravinsky’s depersonalising, Dionysian authorial absence under the notions of “ritual” and “distancing”, “Keys to Stravinsky” also resonates strongly with the Rite side of Harvey’s Rite-Rake coin. “In his chief works this ritual element [“the realm of the sacral”] replaces the lyrical and the purely entertaining such as we find them in the works of so many other composers….Whether the subject be sacred or profane, Stravinsky's music is always in a profoundly inward and mysterious way the celebration of a sacral rite,” as Pierre Souvtchinsky writes. In the Sacre this quality still appears diffuse, sensuous, enveloped in a “magic resonance”, overflowing with sumptuous Bacchanalian poeticism, and masked by a romantically tinged subjectivity. But in Les Noces it is overwhelmingly clear, and so it was to remain in the Symphonies of Wind Instruments, in Oedipus Rex and the Symphony of Psalms, right up to the Mass and the last serial works, Threni and Requiem Canticles. This latter idea of Stravinsky trading in a world of entertaining, “assimilated” music juxtaposed at will in a manner that “accepts its function as commodity, conceals alienation, and becomes entertainment” (Paddison 2003, p. 194), is, of course, also the essence of Adorno’s (1984) early critique of Stravinsky’s post-1920 music. So whether Stravinsky’s “voice” appears to have been absented by a Dionysian, ritual quality, found primarily in his pre 1920 works, or, as is typical of the post 1920 works, surrogated by the entertaining use of assimilated commodity music, the question of locating Stravinsky's “voice” has been, and continues to be, a central concern of Stravinsky scholarship and one that contributes considerably to the demarcation of contrasting style traits across his oeuvre. What these two initial examples highlight, then, is an intriguing change in Stravinsky’s strategy of voicing between the authorial absence of his earlier works and the authorial surrogacy of his later neoclassic works. Compare and contrast for example The Rite of Spring, Les noces, the Three Pieces for String Quartet and even much of the Symphonies of Wind Instruments with The Rake’s Progress, Oedipus Rex, the Octet, and the Symphony in C. It is difficult to imagine this latter (neoclassic) quartet without the names of Mozart, Handel/Verdi, Bach and Beethoven looming large. Their names play-out the role of something tantamount to “co-composer(s)” of these highly dialogical works in a manner that is simply not evident in the former (Russian-Turanian) works. This idea of authorial surrogacy as a motivation for the neoclassic works, however, is a moot point in contemporary Stravinsky scholarship. Taruskin (1993) has long argued that we have been duped into this highly conditioned response of hearing Stravinsky’s post-Octet works as dialogised against the “voices” of classical antecedent composers. Following Messing’s (1998) dedicated study of the etymology of the term, Taruskin has long asserted that “neoclassicism” was a conceptual contrivance built on the foundations of Boris de Schloezer’s (1923) description of the Symphonies of Wind Instruments as a “system of sounds”. From this formalist reading of Symphonies (as much, if not more, a Turanian work than it is a neoclassical one), Stravinsky, and his official spokespersons, drew the link to the geometric perfection of Bachian counterpoint as the aesthetic ideal of 1920s “modern” music. It is from this dubious mind-set of modern music going “back to Bach”, that musicology developed a receptivity to virtually all of Stravinsky’s post 1920s music as dialogised against the “voices” of other past “masters”, often to the exclusion of hearing them as an extension of Stravinsky’s earlier Turanian ideals. Despite this, Taruskin’s contextual caveats against the use of the term have been far from universally accepted in practice. Hyde (2003), for one, continues to read the double-/dual-voiced nature of “neoclassicism” compellingly as a manifestation of various forms of “anachronism”. Persuasive though the contextual argument is for exposing this over-egging of the “neoclassical” pudding in Stravinsky scholarship, we nonetheless live in a hermeneutic climate overshadowed by, or basking in (depending on one’s perspective) Barthes’ (1977, pp. 142-148) influential theories concerning “The Death of the Author.” Whether or not Stravinsky intended us to hear these works as dialogised with the voices of past masters, and whether or not to that end he and ensuing commentators have created a construct of neoclassicism built upon dubious historical foundations, is largely a separate issue—albeit one of valuable historical insight. Today, any dialogical power in Stravinsky’s music lies as much in the creative act of interpretation, as it may, or may not, in the object of interpretation itself. Stravinsky’s, and musicology’s, advocacy of a concept of “neoclassicism”, in other words, finds its utility less in any credibility it may have as a historically valid construct and more in the sense of what Kramer (1990, p. 12) has called a “hermeneutic window”. It offers a springboard for dialogical readings of Stravinsky’s music which may or may not find vindication in individual acts of creative interpretation. One can set aside on hermeneutic grounds, then, the problematic historical underpinning of the neoclassic concept as a predicate for a double-voiced musical language built on authorial surrogacy. “Voicing”, however, is a far more curious phenomenon in Stravinsky's music, and music theatre, than this polarity between The Rite and The Rake (or Turanian absence and neoclassic surrogacy) suggests. A radical transformation occurs between the early post-Rite of Spring, so-called “Turanian”, works (written between 1913 and 1920) and the ensuing “neoclassic” works (written between 1920 and 1955). The transformation is most apparent in the contrasting theatric devices of physical voicing. The earlier music theatre works often employ more than one singer to physically voice an individual stage character—just as many “puppeteers” manipulate an individual puppet in Japanese bunraku theatre—while the later theatre reverts to the traditional “theatre of illusion” convention of voicing each stage character with only one singer. This article will demonstrate, however, that Stravinsky’s music more than compensates for this with recourse to multiple “voices” in, what I will term, the realm of hermeneutic voicing (the realm in which we hear the “co-composers” at play in Stravinsky’s dialogised works). 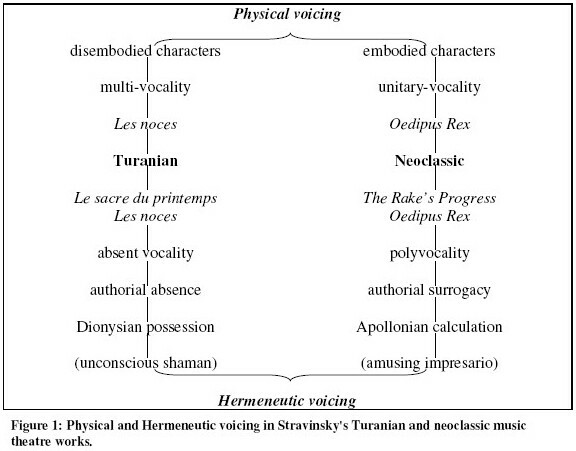 Since this migration of multi-voicing from the physical to the hermeneutic realm is split across what many commentators regard as a stylistic divide between the Turanian and neoclassic works, a brief introductory outline of Stravinsky’s music theatre works and their disposition across this divide is in order. In the wake of The Rite of Spring—that notable landmark of early twentieth century music theatre—Stravinsky’s aesthetic underwent many radical changes, focussed on what Taruskin has dubbed the “Turanian” period. According to the grand narrative, these post-world-war-one idiosyncratic works mark the transition from the so-called “Russian” ballets (The Firebird, Petrushka and The Rite of Spring) to the neoclassic works. Their aesthetic ideology eschews “panromanogermanic” (Taruskin 1996, p. 1167) genres of the western canon, seeking refuge instead in what Gordon dubs some “ethnic ghetto” (1985, p. 30). Notable hallmarks from this transition include a marked reduction in instrumental resources; the use of idiosyncratic genres and ensembles; a turn to folk and post-symbolist–inspired oriental art (without the need for ethnographic accuracy); an increasingly abstract, primitivist use of short, repetitive motivic cells; a constructivist, futurist inspired influence in deploying musical machines (most notably the pianola); and an increasing movement away from the use of texts as narrative conveyors to texts treated as syllables wrought raw. Stravinsky dubbed this latter trait his “rejoicing discovery” (1962, p. 121); one of many strategies of setting texts to music that Stravinsky employed with the intention of distancing the audience from any semantic content or remnants of narrative continuity. The breeding ground for this transitional period comprised many miniature works from the Three Japanese Lyrics of 1913 for soprano and piano to the Four Russian Songs of 1919 via a number of oddities, such as the Study for Pianola of 1917. The resulting progeny that defines the generation, however, are three key works of experimental music theatre whose idiosyncratically subtitled genres mark out their Turanian credentials: Renard [Baika], “a merry play with singing and music” for four male voices and fifteen players (1916), The Wedding [Les noces, Svadyebka], “Russian choreographic scenes” for soloists, chorus and a variety of possible ensembles ranging from chamber orchestra; harmonium, cimbaloms, pianola and percussion; to four pianos and percussion (1914-1923); and The Soldier’s Tale [L’Histoire du soldat] “to be read, played and danced”, for three actors, a dancer and seven players (1918). The end of the transition and the beginning of the neoclassic works is also marked with another unusual music theatre work, Pulcinella, a ballet with song in one act (1920). Of these works, only one, The Soldier’s Tale, employs the device of a narrator—a device to which Stravinsky would return in his neoclassic period, most notably in Oedipus Rex (1927), an opera-oratorio hybrid genre that—though technically a neoclassic work, harkens back to the ambivalent oddities of the Turanian genres in many theatric respects. The remaining three, Renard, The Wedding and Pulcinella, however, employ a musical theatre device to which Stravinsky would seldom return: the breakdown of association between one character and one (singer’s) voice—a principle of disembodiment in which the singing voice is separated from the stage character whose enunciation is often given over to more than one singer. Stravinsky’s general abandonment of this “all (voices)–for–one (character)” technique in his ensuing neoclassic works, notably his three operas, Mavra, Oedipus Rex and The Rake’s Progress did not, however, herald a conservative streak in the composer’s approach to music theatre. The physical multi-voicing of these earlier theatre works migrated to a metaphorical or hermeneutic form of multi-voicing by allusive intertextual references enunciated by one singer. This reversion to the default convention of identifying individual singers with individual stage characters did not therefore signal a return to realist theatrical convention—what Brook terms “deadly theatre”: the “bad theatre of unthinking repetition of well-tried formulae” that brings “no challenge to the conditioned reflexes that every department [direction, design, music etc.] must contain” (Brook 1968, pp. 11, 44; cited Cross 1998, p. 132). Rather, this reversal in the mechanics of voicing remained true to Stravinsky’s earlier Turanian approaches to a conception of anti-realist musical theatre conceived, as we shall see, under the influence of Vsevolod Meyerhold. Alongside the switch from multi- to unitary- physical vocality, then, Stravinsky’s music theatre also undergoes a related shift in voice-body disassociation. The earlier works are marked by their, often quite radical, experimentation with disembodied voices while the latter works revert to the more conservative, naturalistic conventions of embodied voices. The early ballet, Les noces, for example, strictly demarcates the movement and voice of “characters” into separate tasks for segregated dancers and singers. This contrasts starkly with The Rake’s Progress; a later opera with conventional on stage singers. Mediating these two extremes is the intervening “opera-oratorio” of Oedipus Rex. Here solo singers “enact” their individual character on stage, as we would expect of an opera, but their movement is restricted to that of immobile statues; a diluted form of “disembodiment” befitting the oratorio side of this hybrid genre. Stravinsky’s music theatre works thus instigate an aesthetic migration of physical vocality along a trajectory away from (radical) disembodied multi-voicing to (conventional) embodied unitary-voicing. This is, however, only one side of a far more subtle voicing equation balanced between the Turanian and neoclassic works. A parallel migration is evident in the realm of what I refer to as hermeneutic voicing. This concept of hermeneutic voicing requires an understanding of “voice” as a metaphor for something analogous to Cone’s (1974) notion of the “musical persona” and Bakhtin’s idea of “heteroglossia” (lit. other- or double-voiced utterances). Hermeneutic voicing is thus something that is found through interpretative acts prompted by the searching question: “who is speaking?” or “from whom does the personal subjectivity emanate?” in a given musical utterance. The question is particularly acute for Stravinsky’s music in light of his above-mentioned edict against expression. If “music is...powerless to express anything at all”, how might it convey the composer’s personal subjectivity, or “voice”? If Stravinsky’s “voice” is not evident in the music (perhaps more accurately we should say if it is not the prominent persona or subjectivity expressed), then, as active interpreters engaged in creative acts of interpretation, we are obliged to ask: “is any voice evident?” and, if so, “to whom (singular or plural) might it belong?” Again we find radically different answers to these questions when comparing Stravinsky’s Turanian and neoclassic music theatre works. The Turanian works exhibit what we might term an absent vocality symptomatic of the Dionysian authorial absence Harvey felt in The Rite. Personal subjectivity is subjugated to collective ritual. Ask “where is the individual in works like Les noces and Le sacre du printemps?”, and invariably one arrives at the answer that it is conspicuous by its absence. Here the hermeneutic voice operates through absent signifiers. All traces of subjectivity appear to have been subjugated to a collective whole. It is precisely this feeling of subjugation of the individual to a collective identity that prompts Taruskin’s infamous reading of Les noces as an emblem, if not musical embodiment, of what he terms Stravinsky’s “subhuman”, fascist sympathies (1997, pp. 360-388). Les noces and the Turanian works are thus, metaphorically speaking, “voiceless” at the hermeneutic level—a subtle reversal of the multi-voicing they tend to exhibit in their trademark multiple, disembodied physical voicing. The neoclassical works, on the other hand, exhibit a polyvocality symptomatic of authorial surrogacy; precisely what Harvey reads as impresario-like “entertainment” and “wit” in The Rake. Here a clash of competing subjectivities emerges from intriguing double- or multi-voiced utterances. Ask where is the individual subjectivity in works such as Oedipus Rex and The Rake’s Progress?, and invariably one is obliged to concede that there is no individual subjectivity, but a duality or plurality of different subjectivities. These competing hermeneutic voices are trumpeted through an abundance of present signifiers. They comprise encoded signs that cue “other” (typically opposed) subjectivities operating within a single musical utterance. As such they represent something analogous to Bakhtin’s literary theory concept of “double-voicing” or “heteroglossia” (1981; 1984). In opposition to the Dionysian possession of The Rite, there is a degree of Apollonian calculation about these double voices. They rely on certain personas operating within the music that submit to the rules of recognisable language styles; styles that are frequently found to be in direct opposition with one another. As with Stravinsky’s contrasting strategies of physical voicing, these divergent forms of hermeneutic voicing call out for contextual-historic, semiotic and hermeneutic interpretation on the part of musicology. Figure 1 summarises these contrasting voicing strategies. The symmetry between physical and hermeneutic voicing is apparent. In the Turanian theatre works many physical voices (i.e. singers) enunciate an individual character but the hermeneutic personae of those characters is sacrificed to a (subjectivity obliterating) collective. In the neoclassic works one physical voice enunciates an individual character but the hermeneutic persona of that character is double or multi-voiced. The neoclassic theatre works therefore exploit “one for all” voicing (i.e. a singular physical voice for plural hermeneutic voices) where the Turanian theatre works exploit “all for one” voicing (i.e. plural physical voices for a singular hermeneutic voice). Through this unashamedly contrived analogy to the Musketeer’s motto, this paper constructs an interpretative framework for Stravinsky’s music theatre from the opposition of “one for all and all for one” voicing. Before proceeding to explicate these respective hermeneutic voicing strategies, a brief aside on Cone and Bakhtin is called for. Prompted by his reading of Schubert’s “Erlkönig”, Cone identifies three “personas” operating in the accompanied song (a genre he regards as analogous to opera on a smaller scale): “the vocal, the instrumental, and the (complete) musical” (1974, pp. 17-18). Cone further demarcates these personas: the vocal persona is “explicit” (i.e. it expresses itself in text expressed through the human voice); the instrumental persona is “virtual” (i.e. “a creature of analogy, an imaginary construct”); and the complete musical persona is “implicit” (i.e. “inferred from the interaction of the other two”) (p. 18). These personas offer useful perspectives in identifying certain subjectivities at play, both in music in general, as Cone demonstrates, and as this paper advocates, in Stravinsky’s music theatre works in particular. Cone’s ideas are fundamentally grounded on what only later became associated with Bakhtin’s notion of “voice”. Abbate (1991, pp. 11-12) succinctly summarises this notion in drawing the connection with Cone: “voice is understood in a Bakhtinian sense, not literally as the reported dialogue of this or that character within the novel, but as registers of speaking that are the mark of narrator-speakers inhabiting the text” (1991, pp. 252-253). Prompted by his reading of Dostoevsky’s poetics, Bakhtin (1981; 1984) formulated this literary theory concept of voice into his theory of the double-voiced utterance. For Bakhtin, an utterance (let us permit it to be musical or literary) is double- or other-voiced when we hear in it two separate language styles or ideologies that pull in opposite directions. The so-called “wrong-note” classicism of Stravinsky’s neoclassicism is an obvious case in point. The opening compound chord of the Symphony of Psalms (a superimposed hybrid of C major and E minor triads), for example, pulls not only in the opposed diatonic directions of C and E, but also in the opposed tonal directions of tonality vs. polytonality [Example 5a]. This in turn pulls in the opposite ideological directions of opposed “language styles”: eighteenth-century classicism cuts against twentieth-century modernism. Straus (1987) has also shown how this same (C major vs. E minor) compound harmony pulls in the opposite direction of teleological sonata form and static arch form in the Symphony in C. Both these examples can be read as an encoded double-voicing of two competing ideologies: organic composition vs. fractured block juxtaposition. Employing Taruskin’s (1996, pp. 1501-1502) more emic terms, we might identify this as an opposition between the two musical dialects of kul’túra (the civilised, hypotactic, “panromanogermanic” culture against which Stravinsky’s Turanian works were written) and stikhíya (the elemental or natural dynamicism that became the hallmark of the paratactic Turanian style; something tantamount to Stravinsky’s idiolect between 1914 and the early 1920s). Compound utterances such as these occur at the level of hermeneutic voicing. They require creative acts of interpretation to extract them from the music. Their implicit duality or plurality presents a subtle counterbalance to the explicit unity found in the conventional physical voicing of the neoclassic works. These utterances are by no means constrained to mere syntactic devices operating at a level of “introversive semiosis” —such as the compound harmonies identified above (the “Psalm” chord or the competing tonalities of C and E in the Symphony in C). They are just as prevalent at the level of style, or “extroversive semiosis”, as opposed gestures, topoi, allusions and quotations; musical signs that draw intertextual references beyond the confines of what we might call Stravinsky’s “authorial” voice. This can be seen as much in so-called “absolute” (i.e. “non-programmatic”) music as it can in narrative music theatre. Though not strictly a music theatre work, then, the Symphony of Psalms offers a good example to explore the interaction of Cone and Bakhtin’s concepts. Like the opera-oratorio of Oedipus Rex (a work riven between the concert hall and the music theatre), it is a hybrid, double-voiced, genre. In conception alone the work pulls in the opposite directions of a “pure” orchestral symphony and a “referential” choral setting of the psalms. We might tentatively assign Cone’s personas here. The (complete) musical persona is double-voiced at the level of genre between the language styles and ideologies respectively of symphony and choral psalms. The “implicit” instrumental persona of the orchestra tends to align with the former. The “explicit” vocal persona of the textual chorus tends to align with the latter. Furthermore the vocal persona here—as we will also see with Les noces—is a classic example of what Cone terms a “multiple persona”: “a group in which each member forgoes his individuality to take part in a common enterprise” (p. 66). There is scarcely a single choral utterance in the work that signals anything but (individual subjectivity-sapping) homophonic unity among the “individual” choral parts. Even the notable polyphonic exceptions (the second movement and Figure 20-22 of the Finale) are confined to imitative fugues and canons; the ultimate forms of (“Apollonian”) subordination and regulation of individuality to a collective whole. Humble, supplicatory, introspective. Hushed, awestruck. Well-matched components. But not Stravinsky. He attacks: a brusque, startling pistol-shot of a chord, followed by some kind of Bachian finger exercise. It’s the very antithesis of the Schubert-Wagner approach. Its loud, extrovert, commanding. And that’s incongruous [Bakhtin might say, “double-voiced”], a sublime dramatic joke. It’s a prayer with teeth in it, a prayer made of steel; it violates our expectation, shatters us with its irony. And that’s precisely why we’re so moved by it….Yes, there [Figure 4] is that imploring Phyrgian incantation in the vocal part [vocal persona]; but underneath the orchestral accompaniment [instrumental persona] is steel and chromium. It’s a trick, a black joke. (1976, pp. 387-389). The movement thus unfolds along similar “incongruous”, “double-voiced” lines. Compound utterances of dual styles appear in self-contradictory opposition with one another (medieval plainchant penitence vs. eighteenth/nineteenth-century piano etude virtuosity) or appear to be written in a musical persona (“steel and chromium”) deliberately set against the absent signifiers of what the music ought to sound like (humble, supplicatory, introspective). These compound utterances, expressed through referential extroversive semiosis, are every bit, if not more, communicatively expressive of polarised ideologies and language styles than are those opening compound chords of C major and E minor operating through introversive semiosis. The above description of Symphony of Psalms suggests that the real interpretative interest in Stravinsky’s music theatre might lie in hermeneutic, more than physical, voicing strategies. Cone’s distinction between “legitimate” and “illegitimate interpretation”, however, offers an interesting interpretative angle on Stravinsky’s concerted efforts to depersonalise his music theatre characters by forcibly separating the person (of the singer) from the persona (of the song). “Legitimate interpretation”, for Cone thus occurs when “the persona is never identical with the singer”. “Illegitimate interpretation”, on the other hand, occurs when we “hear the singer speaking through the persona…converting the composer’s voice into a medium for his own self-expression” (Cone 1974, p. 62). Stravinsky was never the greatest advocate of any form of “self-expression” on the part of the performer—as his edict on performance as “execution” over “interpretation” in the sixth lesson of his Poetics of Music (1994, pp. 121-135) attests. In light of Cone, we might say of his early music theatre works, such as Les noces, and later Oedipus Rex, that they are intent on going even further to annihilate the “embodied persona” of the vocal performer through physical voicing strategies of voice-body disassociation. What Cone terms the “actual vocal persona of the singer” (p. 65) is obliterated by disembodying the singers from their on-stage characters. In the case of Les noces, Stravinsky’s music accomplishes this by relegating the “soloists” to the status of mere emergent voices from a chorus—a “multiple persona” in which individuality is lost in “a common enterprise” (p. 66): i.e. the presentation—not the dramatic enactment—of an ancient wedding rite. Here individual voice is subjugated to a multiple persona. This is strikingly evident in the relationship between “soloists” and chorus from the outset of the work [Example 6a]. Both are characterised by unison or rhythmic homophony. What Van den Toorn (1983, pp. 138-139) terms “metric type one” (predominantly homophonic rhythm set in irregularly shifting metres) saturates the texture, to the near total exclusion of “metric type two” (polyrhythm within a single meter). This “unity” is extended to the relationship between vocal and instrumental personas. These are almost identical with one another, there being little to distinguish the material of vocalists and instrumentalists. Thus, not only are the soloists assimilated into the chorus as “a component of one persona” (p. 66), but the chorus is, by and large, assimilated into the instrumental ensemble as one persona. There is then, in Cone’s terms, almost no distinction between vocal, instrumental and the complete musical persona in Les noces. It is an extreme form of depersonalisation that relegates all persons and personas to the status of constituent parts of the same “multiple persona”. Just as Stravinsky depersonalises the constituent individual four-part instrumental personas of a string quartet into a veritable percussion machine in the middle piece of his Three Pieces for String Quartet, so too in Les noces vocal personas are “instrumentalised” into percussion on a par with the actual percussive ensemble that “accompanies” the work. In Bakhtin’s terms, the work is predominantly monoglot, or single-voiced in contradistinction to the type of heteroglot double-voicing found above in the Symphony of Psalms and, as we shall also see, in Oedipus Rex. Figure 2 tracks this “multiple persona” operating in these opening bars of the work. The paradigmatic table highlights Stravinsky’s hallmark juxtaposition construction techniques; the additive durations of which are evident in the fixed and variable durations (shown both in the number of meters (the figure in square brackets) and their respective eighth-note durations (the adjacent number)). 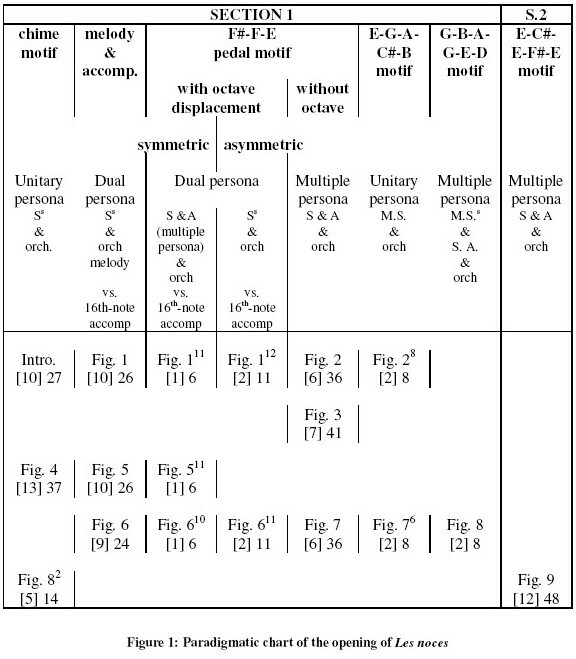 Only the second [Example 6b], third [Example 6c] and fourth [Example 6d] paradigmatic columns offer what I have termed “dual” personas by virtue of the sixteenth-note figures which constitute a qualitatively different instrumental, “accompaniment”, persona to the surrounding musical persona. All other paradigms are what I have termed “unitary” [Example 6a] (where an individual vocal persona merges with the instrumental persona) or “multiple” [Example 6e] (where more than one vocal persona merges with its instrumental persona). The sharing of an individual character’s voice between more than one singer in Les noces and its subjugation of multiple vocal personas to an individual voice are both vocal strategies recognised by Cone: “there are many examples in which the composer has apparently not yielded to the demands of dramatic propriety—compositions, say, in which a soloist may stand for a multitude of people, or in which a chorus may represent an individual” (1974, p. 69). He even cites Stravinsky’s deployment of two solo basses for the voice of God in The Flood. This is a rare example of “all for one” physical voicing in Stravinsky’s later works that Cone suggests may have been prompted by a need to symbolise the “superpersonality of God” (p. 69); much as Schoenberg does in Moses und Aron “by assigning His voice to a complex combination of solos and chorus, of singing and Sprechstimme” (p. 69). The disembodied multi-voicing of Les noces is another obvious example. Although, Oedipus Rex does not employ any physical multi-voicing of characters, the idea of the “disembodied persona”, as noted above, remains in that work a crucial voicing strategy for Stravinsky on two levels. On the physical level, embodied singers are immobilised and depersonalised on stage by their restricted statuesque motion, their concealment behind masks and their use of the “dead” Latin language. Combined this comprises a soft core alternative to the total disembodiment of Les noces. On the hermeneutic level, Stravinsky “double-voices” what Cone calls the “musical persona” through the type of authorial surrogacy of allusive references also detailed above in The Rake’s Progress and the Symphony of Psalms. Take for example the surrogate other voice of Verdi, prominent in Oedipus Rex through a number of overt intertextual allusions. These range widely. In the Messa da Requiem, the “Qui Mariam absolvisti” theme of Verdi’s Dies Iræ, Ingemisco double-voices Oedipus’s “Invidia fortunam odit” aria through explicit quotation, as too the Tuba mirum fanfares of the same Dies Iræ double-voice the Messenger’s trumpet fanfares in Act II of Oedipus Rex. La Traviata is similarly invoked: Violetta’s “Sempre libera degg’io” aria interanimates the “Cui rex interfikiendus” dramatic climax of Jocasta’s aria. Even Aida is “heard”, if we are to accept Bernstein’s (1976, p. 399) bold assertion that the opening four beats (Bb-C-A-Bb) of Oedipus Rex are modelled on the lyrical appoggiaturas of Aida and Amneris’s “Pietà ti prenda” duet. And this allusive “double-voicing” is by no means confined to these utterances or Verdi alone. Both Bernstein (1976, pp. 393-417) and Taruskin (2003) present Stravinsky’s opera-oratorio (albeit from very different perspectives) as a virtual anthology of allusive, double-voiced, intertextual references to a whole host of other-voiced authorial surrogates ranging from the classical western canon, through what Bernstein hears as “football fight songs” to what Taruskin hears as the clichéd “moustache twirling” diminished seventh chord villain of the “silent” cinema. This concept of music theatre as ritual re-enactment holds the key to understanding many of the ideals of Stravinsky’s music theatre and their realisation in “one for all, and all for one” voicing strategies. This is evident when we examine these works in their socio-historical context as products of a Meyerholdian-inspired conception of music theatre; a conception intent on degrading or misaligning the semantic content of text and characterisation. Stravinsky’s professed desire for caricatures (generic stock-characters, chosen for their “Russian typicality”) in place of real characters belies his post-symbolist orientation: he strives for an evocative suggestion of this wedding rite with a detachment that does not permit any emotive identification with individual characters. In this respect “all–for–one” voicing is an apt anti-illusionist theatrical tool. Perhaps Stravinsky wanted to create his own set of commedia dell’arte type stock-characters for the social interaction around a typically Russian pagan wedding for which the theatrical world familiar to western European audiences has no established repertoire of conventional characters? Les noces, then, is not so much a case of Six characters in search of an author (to refer to Pirandello), as an author in search of six or so caricatures; caricatures which have no identity and no discernible personality; caricatures that represent mere cogs in the machinery of social interaction surrounding the pagan wedding. Like all cogs in a machine, they are fundamentally interchangeable, as are the voice–to–“character” relationships in Les noces. Stravinsky’s distinction between dramatized theatre and descriptive music (individual characters unfolding dramatic action) vs. his own brand of presentational music theatre (the observation of interchangeable stock-characters participating in social rituals) alone is not enough to explain the “all–for–one” voicing. A similar distinction between descriptive and presentational drama holds for many of the neoclassic works, including Oedipus Rex, where individual singers are identified with individual characters. The literature on “all for one” voicing in the Turanian works is largely unquestioning of Stravinsky’s motives for adopting the device because it conveniently underscores his aesthetic espousal of depersonalisation. The initial influence for disassociating voice from body appears to have been Benois’s two theatrical experiments for Diaghilev’s 1914 spring season in St. Petersburg. The first of these influential productions, a version of Rimsky-Korsakov’s Coq d’or in the form of an opera ballet, disembodied the voices of the singers (who were placed around the stage in everyday clothes) with the action embodied by dancers and mimes. The second, an experimental production of Stravinsky’s own Nightingale premiered at the Maryinsky theatre, employed a similar disassociation of music and stage action: “the action was carried out by silent players at the front of the stage, the singers had music-stands with their parts on them, and the chorus stood motionless on the right and left of the stage” (Druskin 1983, pp. 56-57). Both works highlight the aesthetic alignment of the Mir iskusstva (Diaghilev’s “World of Art” group which held sway over much of Stravinsky’s early music theatre ideas) with the theatre theories and practice of Vsevolod Meyerhold, who would direct his own version of The Nightingale at the Mariyinsky Theatre in 1918. Stravinsky would have been familiar with Meyerhold’s contemporary writings in his journal, The Love of Three Oranges – The journal of Doctor Dapertutto, first publishing in February 1914, which promoted theatre methods similar to that of Brecht’s alienation. Stravinsky was also undoubtedly influenced by Meyerhold’s earlier publications, most notably his seminal article, Balaganchik [“The Fairground Booth”] which championed his ideas on “stage production in the manner of the traditional travelling theatres, with their use of masks, dance, acrobatics and other devices long since relegated to the circus and pantomime” (Walsh 1993, p. 14). This influence is more overtly prominent in Reynard, L’Histoire and Pulcinella—works of acrobatics, itinerant theatre and commedia dell’arte. The disassociating of singers and dancers also evident in Les noces, is equally apt for Meyerhold’s theatre “of the fairground booth, where entertainment always precedes instruction and where movement is prized more highly than words” (Braun 1969, p. 127; cited Walsh 1993). If movement is valued above words, the logical consequence (short of the absurd, if not impossible, task of training singers as acrobatic dancer-actors) is to adopt a division of artistic labour that brings into the theatre (or rather, takes the theatre out to) the specialist movement experts of dancers, acrobats and actors, while at the same time confining singers to the role of interchangeable vocal “instrumentalists” (duly situating them in the ensemble, or even sometimes visibly with the on-stage ensemble) according to the principle of his “rejoicing discovery” (the downgrading of words to syllables of sound instead of linguistically meaningful units). If singers are mere instruments for enunciating syllables, why limit any character to one “instrument” when you can have the full colour and registeral resources of a four-voice ensemble? There is a clear correlation, then between Meyerhold’s theatre of the fairground booth, the elevation of movement above words, and Stravinsky’s rejoicing discovery that elevates syllables above words: both devices eloquently merging in the all–for–one theatrical voicing of Les noces. The separation of singers and dancers also underscores Meyerhold’s Brechtian influence in creating the ideal conditions for a “theatre of illustration” that demands the separation of all heterogeneous theatrical elements to greaten the effect of alienation and move away from the realist “theatre of experience”. This is perhaps what lies behind Stravinsky’s description of Les noces as music that presents rather than describes. The art of presentation is an art that makes explicit the means by which it presents—as Brecht says, “the theatre of illustration illustrates” (Brecht, cited Druskin 1983, pp. 54-55). Description, on the other hand, strives for a seamless translation of phenomena without intrusive stylisation. Druskin suggests that Stravinsky was already acutely aware of “a new kind of convention involving new laws to produce a counterpoint between stage and music” in the works immediately following his conception of Les noces in 1914, a year before Renard. Daniel Albright rightly takes issue with Stravinsky’s final observation: it is “a stylisation quite unlike Kabuki theatre” for precisely the reasons he articulates. “Stravinsky’s actors were not determinate, single-thrusting, like the Japanese actors who bear their fixed identities incised on their masks or make-up; they were instead molecules unconsciously agglomerating into forceful motion” (1989, pp. 26-27). If, as Albright suggests, The Wedding is Kabuki-like, “it is Kabuki smashed into a thousand pieces that gradually reassemble before our eyes: the action is irresistible, though the actors are negligible” (1989, p. 27). Perhaps Stravinsky had in mind a more general resonance with Kabuki traits such as the use of the (on and off-stage) instrumentalists to enunciate the character’s actions or thoughts through conventional associative rhythms or even the quick-change technique of hayagawari (when the principal actor, aided by their assistant, performs a highly-choreographed, rapid, on-stage costume change). Both of these techniques reallocate some of the individual character’s powers of enunciation to the community of performers and make visible the mechanics of the performance. It does not require too creative a stretch of the imagination to understand the all–for–one voicing in Les noces as a form of inverse vocal hayagawari for solo singers: instead of the performers changing costume to metamorphose into different characters, caricatures change their voices to abnegate personal character identification and development. Whatever the merits of the problematic Kabuki analogy, guests talking about a bride and groom “as if they were not there” sets Stravinsky’s anti-realist theatre on the right footing, a footing he would have made all the more sure had he been able to realise in his own lifetime an abandoned 1919 score with pianos playing “as if the pianists were not there”, employing the ultimate depersonalising musical machine of the time, the pianola, in place of what was to become four pianos. Although Stravinsky had the first two of the four tableaux scored for this instrument—which no doubt he would have placed on the stage—he was forced to abandon the orchestration because of difficulties with synchronizing the mechanical piano with live instruments. It was left to Robert Craft’s historic 1974 recording to realise this 1919 conception for two cimbaloms, harmonium, pianola and percussion—a version Stravinsky hailed with more than a hint of depersonalising glee as “requiring only five players in all” (I. Stravinsky & Craft 1972, p. 198). This eradication of the musicians’ personalities seems to have been Stravinsky’s overwhelming attraction to the “player-less piano” (1972, p. 200) as he felt it should have been named, stating that its use in Les noces “was not to achieve superior performance but to restrict to an absolute minimum the intervention of the performer’s personality” (V. Stravinsky & Craft 1979, p. 164). Many of these essences as we have seen are attributable to the influence of Meyerhold’s theatre. The sublimation of an individual voice to “expressions of a group feeling” is no exception, especially when a solo lyrical voice is sublimated to a corporate percussive gesture—which, as I have argued above, is something of a hallmark of Stravinsky’s Turanian works. Such repetitive mechanical gestures in which individual identities are subjugated to collective activities highlight the ritualistic aspect of Les noces and many of Stravinsky’s musical theatre works. The trait is also prominent in Oedipus Rex and is explored by Jonathan Cross’s chapter on “ritual theatres” via Peter Brook’s (1968, p. 11) four categories of theatre: Deadly, Immediate, Rough (i.e. “popular, folk and street theatre, circus, pantomime and cabaret” (Cross 1998, p. 133)) and Holy (i.e. “the theatre of the invisible made visible…an experience on stage that transcend[s]…[an] experience in life” (p. 139)). We have already seen how Les noces, aided by its all–for–one voicing, makes the transition from conventional, cliché-ridden, deadly theatre to the anti-illusionist immediate theatre of Meyerhold and Brecht via elements of what Brook and Cross would term “rough” and “holy” theatre. As Cross says, “the audience is as much participating in a ritual as observing a play. And, of course, in works where there is no attempt at presenting a narrative, this sense of ritual is all the more heightened—pre-eminently in Les noces. This is where Rough theatre merges with Holy theatre” (Cross 1998, p. 138). This sense of Ritual transcendence evolves from the raw mechanics of essential theatre writ large. A work like Les noces eschews the usual illusionary trappings that might accompany a proscenium arch segregating performers from the community in which they perform. This reintegration of theatre into the community corrupts any conceit of the on-stage character. Stravinsky’s music dehumanises its characters to the status of a theatrical tool manipulated, Bunraku puppet-like, by a number of skilled, preferably visible, performers. In Les noces this comprises the combined skills of two singers and a dancer. Since the essence of ritual is a shared communal participation, the greater the annihilation of individualism, the better, and in this respect Les noces excels. Stravinsky considered many means for degrading them....a performance entirely by puppets...an Oedipus masked like an Oriental sun-god....singers holding up scrolls as they sang their parts, as if we were witnessing not a performance but a rehearsal of a performance from the fifth century B.C....each actor stand[ing] behind his own private curtain, out of which he stepped before singing—thereby fracturing the stage into an ensemble of tiny stages, each inhabited by its own soliloquist....Cocteau [even] designed for Oedipus a mask with pop-out eyes—the Mr. Potato Head approach to Greek tragedy. The general result of these changes is to murder Sophocles’ play—to disable the action and petrify the actors (Albright 1989, p. 30). The musician can approach the words that he puts to music in two ways. First, the word can be treated as sonorous material of expression itself....Second, the word can determine the meaning of the music, [in which case] it is left meaningless without the word. The second approach is the passive one. The active approach is that of the musician who employs the word as sonorous material only, taking no account of its literal significance. (I. Stravinsky & Craft 1984, p. 508; cited Albright 1989, p. 36). These types of text-setting which readily translate into “immediate” or “dead” musical theatre with the addition of staged action also map on to the distinction between his own brand of presentational theatre in preference to dramatized, descriptive theatre to which he referred in Les noces. The wilful destruction of semantic content in his texts thus unites Les noces with Oedipus Rex in a manner that highlights the curious relationship between their respective all–for–one and one–for–all voicing strategies. Again Albright eloquently articulates this point: “the commonest word in the text is dicere—everyone says, answers, or reports, or speaks, or refuses to speak, or tells true, or tells false, no one does....everyone except Oedipus is a message-conveyor or message-frustrator”. It is, he suggests, “an opera of speeches in quotation marks” in which the characters are “only playback devices (or erasing devices) for speeches that are not their own”. He rightly surmises that “the fact of speaking seems of greater interest to Stravinsky than the content of what is spoken” leading him to an observation as true of Les noces as it is of Oedipus Rex: “speech does not belong to anyone in particular, but inhabits a huge, anonymous space” (Albright 1989, pp. 31-32). So anonymous is this space in Les noces that the choice of singer to enunciate the different fragments of speech is incidental. Oedipus Rex may well fix one singer for each character but the musical manners, what I have dubbed the “hermeneutic voices” (i.e. the intertextual stylistic allusions) through which they enunciate that character’s speech appears equally incidental. Typical of his neoclassic theatre works, these voiced musical allusions in Oedipus Rex are well documented. They comprise stylistic misalliances such as the already noted supplicating, blame-ridden near-quotation of the “Qui Mariam absolvisti” music of Verdi’s Messa da Requiem “Ingemisco” at the very moment Oedipus shirks any sense of blame and accuses others of envying his good fortune: “Invidia fortunam odit” [Example 7a]. Another notable example is the incongruous use of “one of Carmen’s sexier moments” Bernstein (1976, p. 399) detects when Queen Jocasta admonishes the royal princes for raising their voices in a stricken city: “are you not ashamed?”, “nonne erubiscite?” [Example 7b]. Unlike their speech, their music does belong to someone in particular—a whole host of different composers, characters and contexts as it happens—but they will not be found in the dramatis personae of Oedipus Rex, they are other voices from other contexts and herein lies the key to Stravinsky’s all–for–one voicing in the neoclassic theatre works. Unlike Les noces, in which any physical singer is capable of enunciating the disassociated body of a metaphorical character (who is not really a character at all but a snatched, emblematic fragment of a typical character), Oedipus Rex employs one singer for an associated body (albeit depersonalised in statuesque immobility) who is capable of enunciating that character through a host of metaphorical, hermeneutic, other voices through blatant stylistic allusion. The overt nature of this allusion is crucial. It is the equivalent of the Meyerholdian laying bare the mechanics of the theatre in the Turanian works. By disembodying the singers (whether directors choose to place them on the stage or not) in Les noces, Stravinsky lays bare the mechanical constituents of his characters: their movement and voice. By making overt the disassociated stylistic allusions through which the characters are voiced in Oedipus Rex, he similarly lays bare this mechanical constitution of movement and voice. This time, however, it is movement (no longer a ballet but an opera-oratorio leaning decisively towards statuesque oratorio-like presentation) that is rendered static while voice kinetically dances in energetic leaps and eclectic bounds around all known musical resources to adopt its many and multifarious other voices. These vocal metaphors enable one character to speak through the voice of another from an entirely different (and frequently diametrically opposed) situation: Jocasta speaks through voices belonging among others to Carmen and the fate motif of Beethoven’s fifth symphony while Oedipus is voiced among others through Verdi’s Requiem and Rameau or Gluck. As with all metaphoric borrowings, the initial seemingly incongruent nature of these other voices with their often contradictory dramatic situations yields intriguing perspectives on the theatrical presentation. A creative tension thus results between the dramatic situation and the allusive reference; one that calls out for close study of the play of hermeneutic voices. Thus we see in both Stravinsky’s one–for–all and all–for–one voicing strategies two very different and seemingly opposite tools of musical theatre equally adept at the principles of a Meyerhold-influenced immediate theatre. Les noces parallels Meyerhold’s “theatre of the fairground” device of elevating movement above words with disembodied, interchangeable, physical voices scattering-out semantically inert syllables à la Stravinsky’s rejoicing discovery. Oedipus Rex, on the other hand, replaces the kinesis of Les noces’ dancers with inert statues that embody the vocal agility of one singer interchanging many eclectically borrowed hermeneutic voices. When it comes to the immediacy of his immediate theatre, both Stravinsky’s voicing tools appear equally apt and both demand interpretation: all–for–one and one–for–all!